Amazon currently accounts for 49.1% of all US retail e-commerce. In distant second is eBay at 6.6%, then Apple at 3.9% and Walmart at 3.7%. No other firm exceeds 2%. 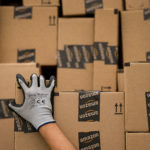 Moreover, Amazon now delivers 26% of its online orders using its own shipping service. In 2013, no Amazon deliveries were made that way. The USPS share of Amazon deliveries; 44% up from 33% in 2013. Good luck FedEx and UPS!